A few weeks ago I received an email from Chobani’s community coordinator asking if she could send me some samples. Free yogurt? Yes please! 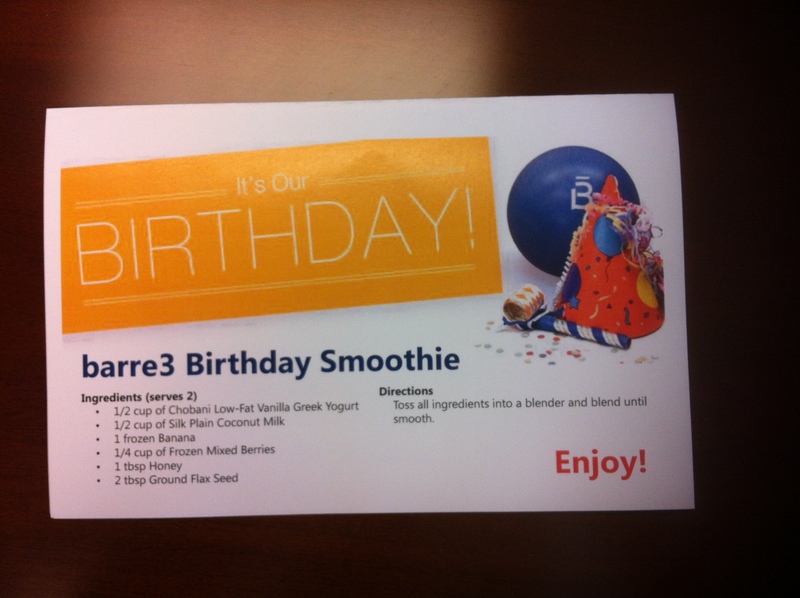 The yogurt’s arrival coincided with the five-year anniversary, or birthday, week of barre3. For those unfamiliar, I’m an instructor at the barre3 Columbus location. The company is all about being tuned into your whole self, and finding balance in your mind, body and life. Why not share my plethora of healthy yogurt with some of my favorite people? The studio owners, Courtney and Whitney, welcomed the idea with open arms. 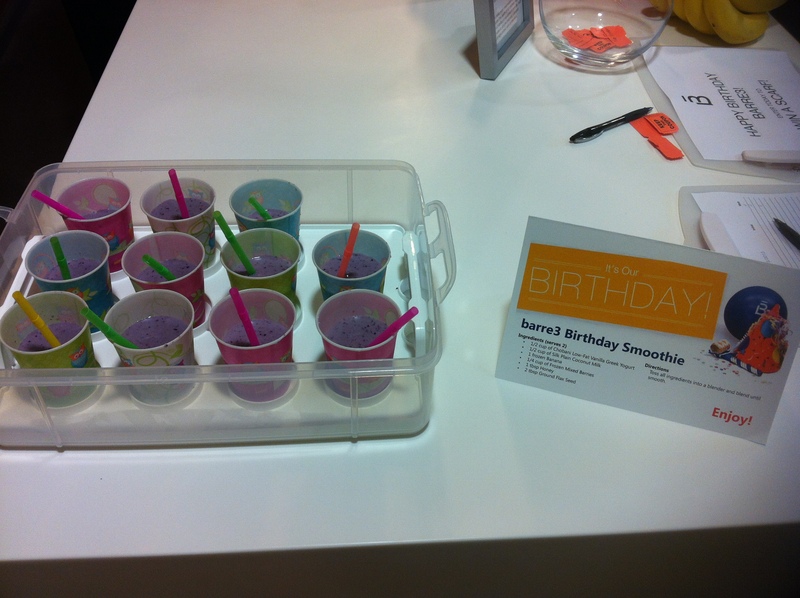 I thought the 6 a.m. crew would be the perfect bunch to try out my barre3 Birthday Smoothie. I reasoned that they deserved the extra boost for waking up when most folks are still snuggled in bed. I was also happy to finally use my cupcake carrier. I have to document this day in case Rob ever forgets why we definitely needed to register for it. 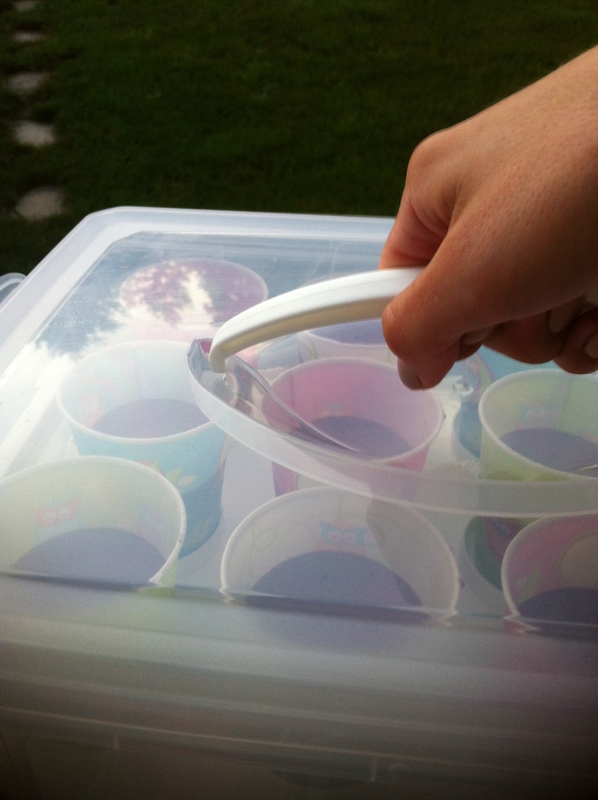 100 percent necessary cupcake carrier. Note: Although it says Chobani Low-Fat Vanilla Greek Yogurt, it was actually non-fat. 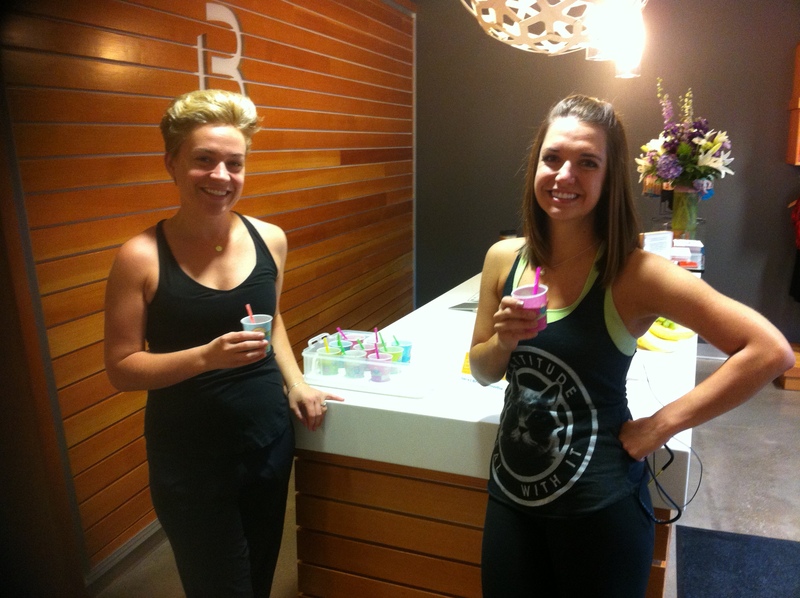 It was fun and rewarding to see clients grabbing smoothies and chatting before running off to get their day started. We received lots of compliments and I’ll definitely be adding this smoothie to my list of regulars. I’m obsessed with the little straws. In case you’re wondering, to create the perfect smoothie sample I poured about 3 oz of smoothie into a 5 oz Dixie cup. I took flexible straws and cut about one inch from the top and two inches from the bottom so they fit nicely into the cups. I definitely recommend trying the recipe, and then getting creative in coming up with your own smoothie concoction. Feel free to share your favorite recipe in the comments! Courtney and I enjoying some morning smoothies! Today marks day one of my barre3 7 Day Body Blast. This challenge couldn’t have come at a better time. 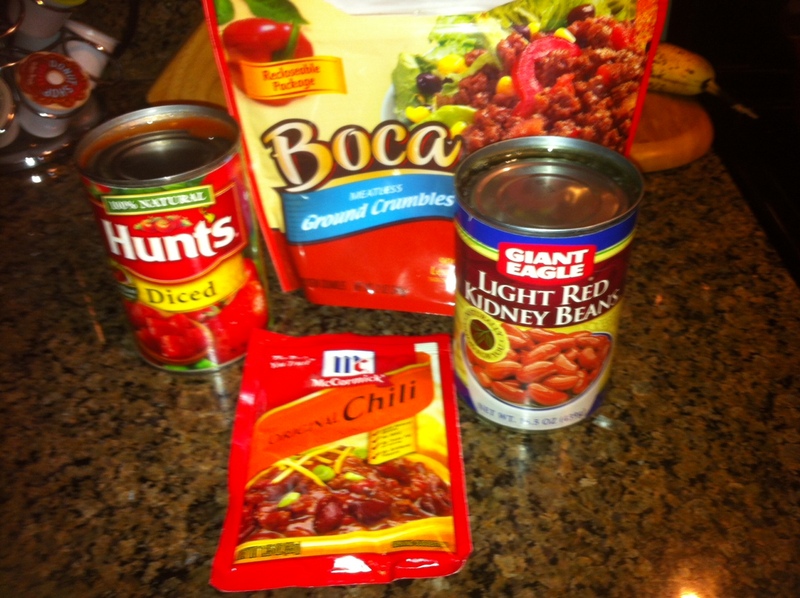 After completing the 28 to Great challenge in February, my body and the way I think about food changed. While I considered myself a healthy eater before, I experimented a ton in the kitchen, using honey and dates as sweeteners, kale as lettuce in salads and spinach/dairy-free smoothies. While I didn’t (and didn’t intend to) drop a lot of weight, I’ve gotten compliments on looking leaner and more toned. The 7 Day Body Blast is simple. You eat a smoothie for breakfast, soup for lunch and a salad for dinner while completing two 10 minute workouts and a 40-60 minute workout 6/7 days. Recipes are on the barre3 blog along with workout suggestions. I know my body and therefore intend to slightly modify this challenge and make it my own. For example, I get light-headed if I’m not eating every 3 hours. I have almonds and a Larabar as my hunger stabilizers. Otherwise, I’m sticking to it! I kicked off today with half of a morning elixir before heading to a studio class at 6 a.m. As much as I tried to love this water/lemon/apple cider vinegar mixture, I have to say it was the most awful thing I’ve ever tasted. Some folks swear by it though, so I’m going to quite literally chug my way through the rest of the week. I also had my Larabar on the way to the studio. 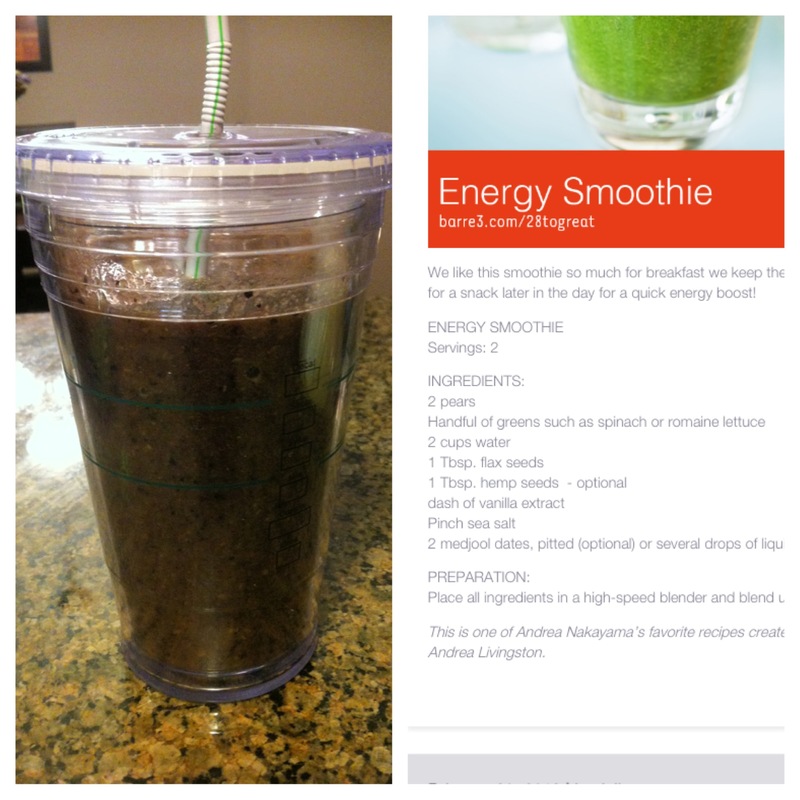 After a great class, I got home and ready for work, then made an Energy Smoothie to take on-the-go. I was hesitant at first, but after chilling it in the refrigerator for an hour it was amazing! The disgusting brown color is due to the fact I added in some very delicious frozen blueberries. 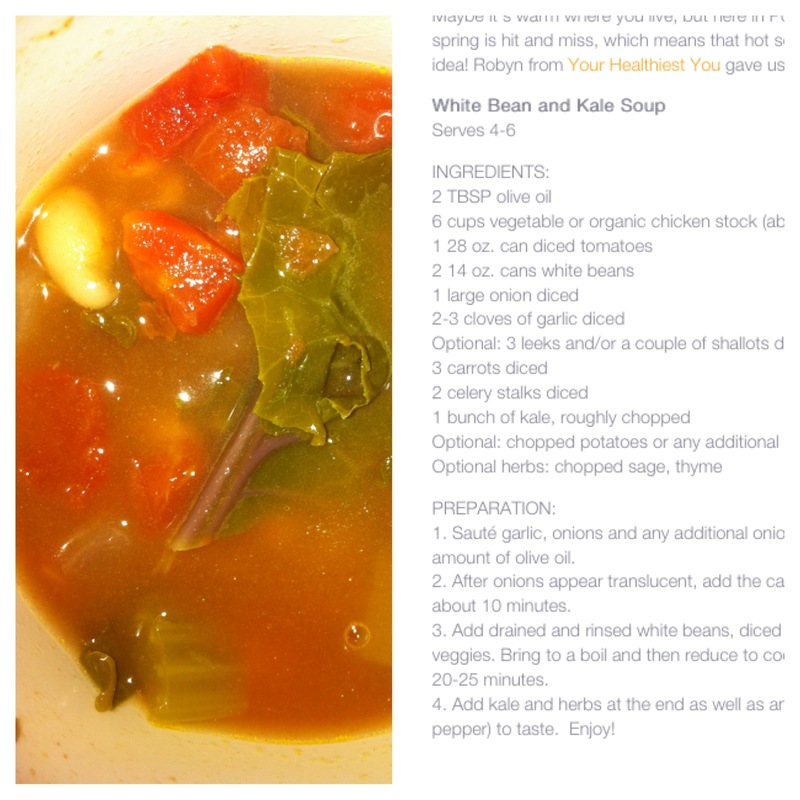 Yesterday, I made a batch of White Bean and Kale soup to take for lunch. 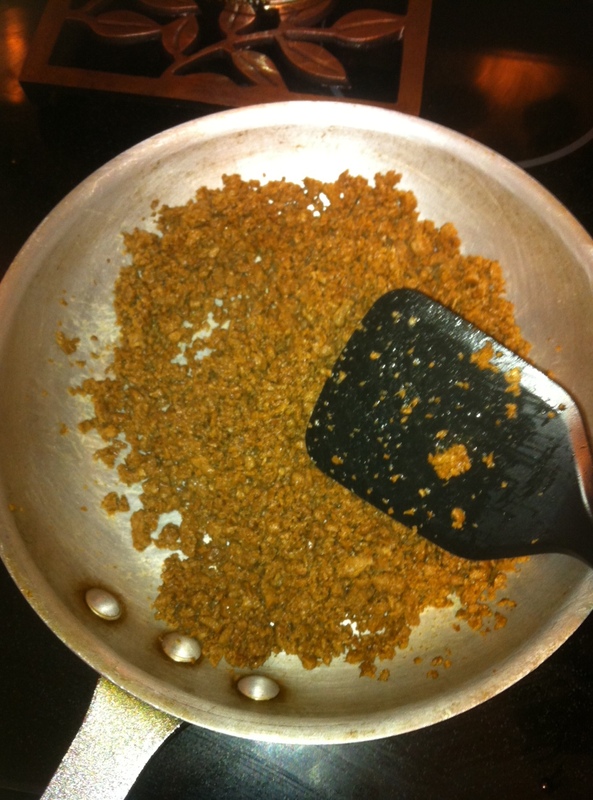 I added some red pepper flakes for spice, but otherwise stuck to the recipe. Result? One of my top 5 favorite soups ever. For dinner, I’m making Salmon & Fennel salad. I intend to do 20 minutes of barre3 online tonight and prepare my smoothie and lunch for tomorrow. I must admit, after looking at the recipes, I was afraid and a little overwhelmed. Not only because of some “new” ingredients but because I thought making a grocery list and finding the time to make it all would be impossible! But as I found out during the 28 to Great challenge, a little planning goes a long way. Later this week I’ll share my grocery list and meal plan in an easy-to-print PDF document in case you feel like embarking on your own body blast.